Back pressure regulators maintain a set point pressure on their inlet by controlling the fluid flow through their outlet. 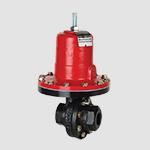 There are applications for this specialty valve type throughout the fluid processing industries. As with all valves, proper inspection and maintenance performed in a timely manner will assure optimum performance and a long operating life. Jordan Valve responds to some customer inquiries with a short video that provides the benefits of the question and the answer to all. The video below provides the company's response to an inquiry about adjusting the seats on a back pressure regulator that employs a sliding gate seat. View the short video, and share your fluid process control challenges with product application specialists. The combination of your process knowledge and their product application expertise will produce effective solutions.